Controlled Pyrolysis Cleaning Ovens & Furnaces | Pollution Control Products Co.
PCPC's Controlled Pyrolysis® models have a highly effective patented system that anticipates and prevents overheating. The ovens have a highly sensitive control system for added protection and operational flexibility. These furnaces can remove the same combustible materials as Dry Cleaner models, but in greater quantities: 2% to 15% by weight. Included in the ovens are primary and back-up water spray features with multiple built-in safety features. Located in the afterburner stack, this sensitive system (U.S. Patent 4,270,898) monitors the rate of smoke emission from the parts by measuring the stack temperature. When the stack temperature reaches a preset point, the stack controller turns on a water spray mist to cool the parts, lowering the smoke emission rate before it reaches an ignition state. The water spray also activates if the oven temperature exceeds its set-point temperature by 30°. A back-up water spray activates should the water spray nozzles become clogged or malfunction in anyway. Additionally, a manual-reset high-limit temperature controller turns off the primary burner if the oven temperature controller should fail. 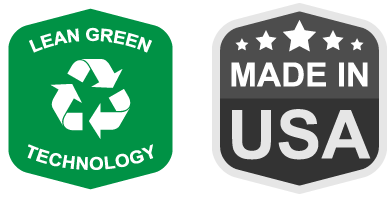 Controlled pyrolysis is a safe process that helps to clean and extend the life of your industrial parts in a method that doesn't pollute or harm the environment. Our controlled pyrolysis ovens eliminate hydro-carbon emissions and the use of hazardous chemicals and abrasives. 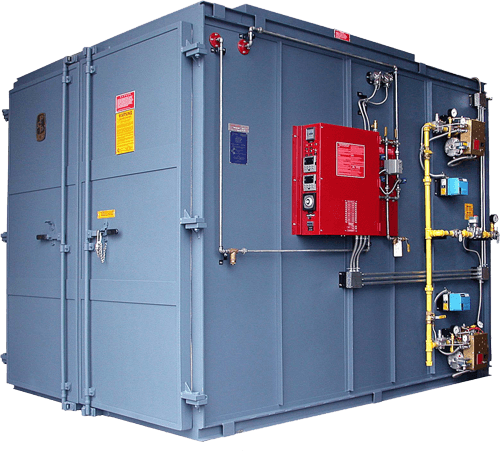 Patented Controlled Pyrolysis® Water Spray System controls the rate of smoke emissions preventing damage due to ignition or over-heated in the furnace. Back-Up Water Spray if nozzles are clogged.